As articulated by Malcolm Gladwell in the introduction, Bill Simmons has the best job in the world – one that all of us would want to have. He is a huge sports fan who watches sports for a living. That fan comes alive every now and then in his writings. He is not the high priest of sports writing. He is the kind of writer that sports fans want to be – one who creates hypothetical situations and debates them to death. If you have the remotest interest in basketball, American football, baseball or ice hockey, then you absolutely have to read his column. He is funny and witty and the likes of Ravi Shastri and Krish Srikkanth must thank their stars that he doesn’t follow cricket. First the good stuff about the book. 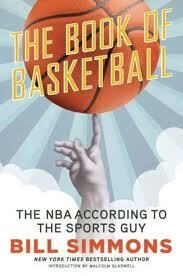 The book is wonderful and gives you a lot of information about the NBA. Its a must have for any basketball fan. The foot notes are funny and there is enough content there to write a book on them. The three most interesting features of the book are the what-if debates ( almost all of them are here) , the pyramid of greatest players – which according to Simmons should replace the Hall of Fame because all players in the Hall of fame cannot be equal and there has to be different levels of greatness and finally the various all-time squads for different situations. Simmons also does a good job of comparing different eras of the sport and that creates the ground for comparing players from different times. There is a lot of research which has gone into the book and it is advisable to read the book with YouTube as a constant reference tool. You will need to watch the videos to fully appreciate the point Simmons is trying to make. My favourite basketball writer lets us down with some of his arguments. He is continuously trying to prove that he is not a Boston homer but in the end he fails to do so. The problem with his arguments is that he is not consistent in giving importance to the same parameters across the board. An example to highlight the point. He argues that Wilt Chamberlain’s team mates were just as good as Bill Russell’s and hence the former Laker cannot be given the benefit of having inferior team mates. In comparing how good the players were, he looks at all-star appearances and hall of fame status. But then he creates a new pyramid which debunks the logic used for hall of fame selections. Most of Russell’s team mates sit high up in the pyramid, whereas Wilt’s team mates are way below. If the Pyramid rankings are used to judge which superstar had better team mates, then Russell’s mates are way superior to that of Wilt. And that nullifies the arguments used by Simmons to settle that debate of ” which player was better” in Russell’s favour. But in Simmons’ defense, it is his passion and his being a Boston homer which makes his writing so special. Therefore, it is worth bearing with the book’s weaknesses and cheering it for being a wonderful guide for any NBA fan. Shelfari / goodreads blog would be a better channel, don't you think? Aditya, Goodreads or Shelfari is great to organize and manage my books/reading preferences. I already use both. But your reviews get lost in the crowd. I want to create a resource for sports nuts like my self. Will also add best places to buy these books, other useful reviews about these books, author bios and related content/suggested reading.